Bach’s fascination with Vivaldi resulted in him transcribing a total of 10 concertos, and their publication in late 1800s was a major contributing factor to the twentieth century resurgence in Vivaldi's popularity. Of the 7 Vivaldi concertos that Bach chose to rework for solo harpsichord, RV 230 is arguably the most famous and best loved. 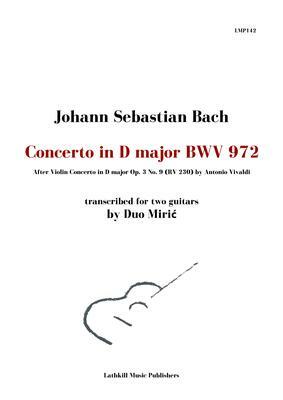 Lathkill Music Publishers are proud to be able to finally make Bach's Concerto in D major BWV 972 available to guitar duos through this fabulous transcription for two guitars by Duo Miric. Duo Miric are twin sister Darka Kooienga (née Miric) and Tanja Miric. They have been playing together for over two decades. Each holds a D.M.A. from the University of Minnesota, an M.M. from Southern Methodist University and a B.M. from Mississippi College. Notable concert appearances include the St. Louis Classical Guitar Great Artist Series, the Schubert Club Courtroom Concert Series, the Fort Worth Guitar Guild, and the Ensemble Showcase at the Guitar Foundation of America Convention. 8 page score plus 6 page separate parts for both players.